Cervical support pillow with cover work together for your comfort and convenience. 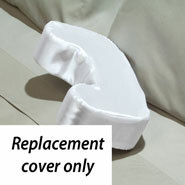 Cervical support pillow is U-shaped and contoured to provide comfortable support and cushioning for head and neck. Made of poly foam, it comes with a removable poly satin zippered cover that can be machine washed and dried. Pillow is 12"L x 7"W x 3 3/4"H overall. Neck opening approx. 5"W.
This is the best neck support pillow! This is the only pillow my mother has used for 20 years. I was delighted to find it as her last one is just about worn out and so was the cover. I bought this pillow for my moth because she has neck problems and I thought it would help with her neck. She loves it and says it's the best thing that has happened for her. I have on upstairs and one downstairs for comfort. This pillow is so comfortable and I use it when I sleep with curlers in my hair at night. It supports my neck and helps me breathe easier. I use this pillow for years and then I buy a replacement because I like this product better than other shapes. I've ordered several of these pillows from Miles Kimball over the years. I even take it when I go on vacation! I use it all the time in my bed. It takes alot of strain off of my neck while watching TV. I have used it to sleep with also if my neck hurts. Best pillow for hairdo and for neck! My mother loves this pillow. She has arthritis in the neck and this pillow cushions and supports her neck comfortably. I only wish it came in more colors. Have used these pillows for years and this one rates right at the top with all of the ones I have previously had .Probably will get another one later. Also have looked over your cataloug and find many things that I have been wanting and will probably look into getting these one day. I used it every time for my Yoga class, when lying down on the floor. Also at my gym, for workouts on the flat bench. It helps prevents injury to my neck and back. It works well and keeps from being injuried. I like to watch TV in bed. But I have degenerative disc disease in my neck. I have been struggling until I bought the support pillow! I buy this for my sister. She absolutely loves it. I really love my pillow. It is very comfortable and helps to limit my snoring. This neck pillow is perfect. I have been using pillows like this for many years. The zipper is perfect; very easy to open and remove the cover for washing. Best neck pillow I have found! I have a short neck, and I love that this pillow doesn't push my head forward too much. OMG! My Prayers Were Answered! I have..
OMG! My Prayers Were Answered! I purchased two of these pillows a while back, one for me and one for my hubby, and we found them to be fantastic. My husband moves his from the bedroom to the couch and vice versa, every day. Is have been looking for them to give an extra to my hubby and as gifts to family members and couldn't find them anywhere on the Net. Google didn't produce them for me. I ended up purchasing 3 other kind of pillows (no satin cases and a different shape) which I still haven't received, and all of a sudden and like magic they showed up here. Hooray! I am purchasing 3 more, and I hope they stay around. I had a tendency and a weakness for developing a stiff, crooked , painful neck extending into my shoulders and this little pillow has been a miracle for me. Please don't stop selling it! What a Godsend! Thanks. Excellent for neck support, pillow case doesn't fit pillow too well and shreds on the inside of pillowcase. Would I buy it again, yes, really helps my neck. I use this when I nap in my lounge chair. I never liked as was small, and nothing to hold it in place on neck. I have some difficulty with my neck and needed some support for it while viewing television or reading. This product works quite well for my purposes, and works better than other similar products I have tried. Been using this item for years. Yes, the material does ravel and makes it difficult to remove for laundry, but the shape is great for sleeping, gives my neck support and saves my hairdo. The zipper is metal and scratches my face if I flip it over in the night. Would like to see a plastic zipper and the tags on the same side as the zipper instead of on the sleeping side. I will still keep buying this item as it is hard to find anywhere else. Actual pillow is good, cover is definitely lower quality than previous pillow covers. Won't last long. I purchased this to replace a similar pillow I bought sometime ago and left in a Hotel room. I was disappointed in this one as the foam is very firm and is not comfortable to rest or sleep on. Product is hard as a rock, not at all flexible. Satin cover arrived with a pull in the fabric. Not recommended by this purchaser. I should have known, I did read some of the reviews. What a bad excuse for a pillow. You just took a hunk of cheap foam and put a cheap flimsy cover on it and sold it as a Cervical Neck Support Product. And over charged me on shipping that was suppose to be Free Shipping. You really let me down Miles Kimball. I would not recommend this product! These pillows were awful. Little, no support, cheap. Give sizes for pillow. ie. 2" wide x 6" tall x 2.5" deep. I have used the cervical support pillow for years and without a doubt this is the worst cover that has ever been provided the material is so thin and when you take the cover off to launder it it ravels so bad you can barely take the pillow out. For this type product I will pay for a good one at a medical supply store. Very good neck pillow - hard to find this shape. I used to have one like this many years ago, and I gave it to my daughter, who said it was the best neck pillow ever! I bought one from Amazon, but the quality was not as good (the cover was too thin and light-weight). The ones I ordered recently from Easy Comforts were perfect! Now, I'm ordering some for me too! I have been looking all over for one of these and you all had it so I grabbed it. To be honest it is the best not only for my neck, but really protects my hair-dos. I have had two of these in the past and loved them. I am replacing one I have had for years. I use mine to protect my hair. I have and use these pillows daily. I like them very much. Need neck support of smaller pillow and it saves my hair do as well. How dense is this pillow? BEST ANSWER: Normal foam pillow.Works well for use in recliner, bed or aircraft. I use mine often.